Preparations for the 3 Dotters Vintage Market this weekend are in full swing! I found some awesome treasures this weekend and many of them will be coming with me! 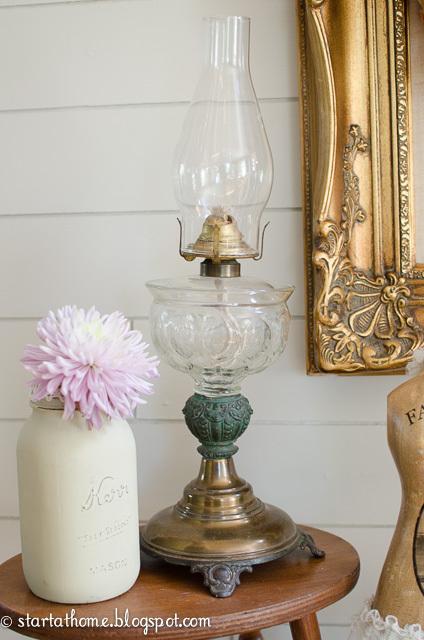 I have been looking for an oil lamp FOREVER and I finally found this one! Isn't it beautiful? I love all the fun details and it is in great condition. I am totally a sucker for milk jugs. When I found these cute little jugs I just had to have them. They will be coming with me to the market. And look at these beautiful teacups. They are Kayson's fine china from Japan. 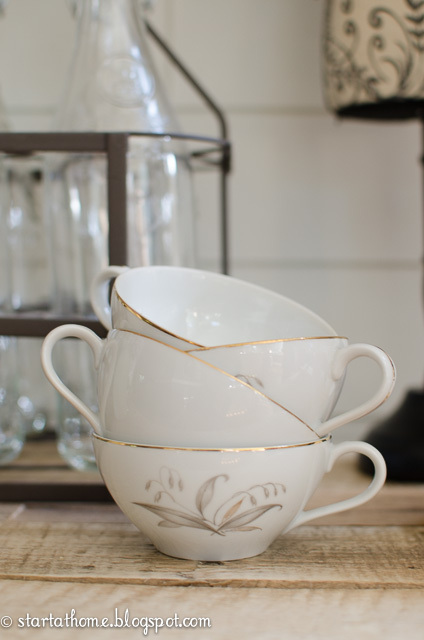 I love the gold trim and the pretty details make these teacups so elegant. 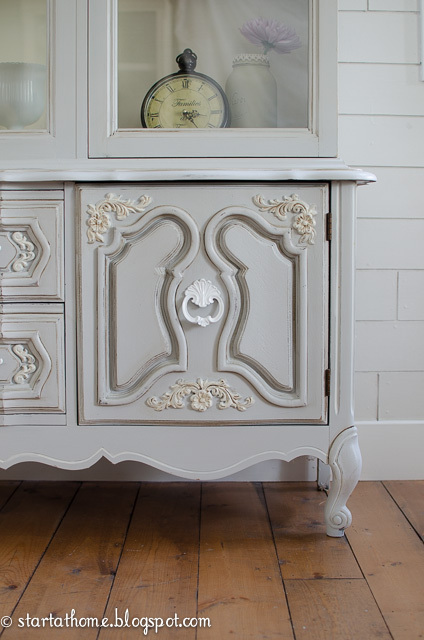 But this dresser is my favorite find!!! Look at how pretty it is! I can't wait to start fixing her up and bringing it back to life!! 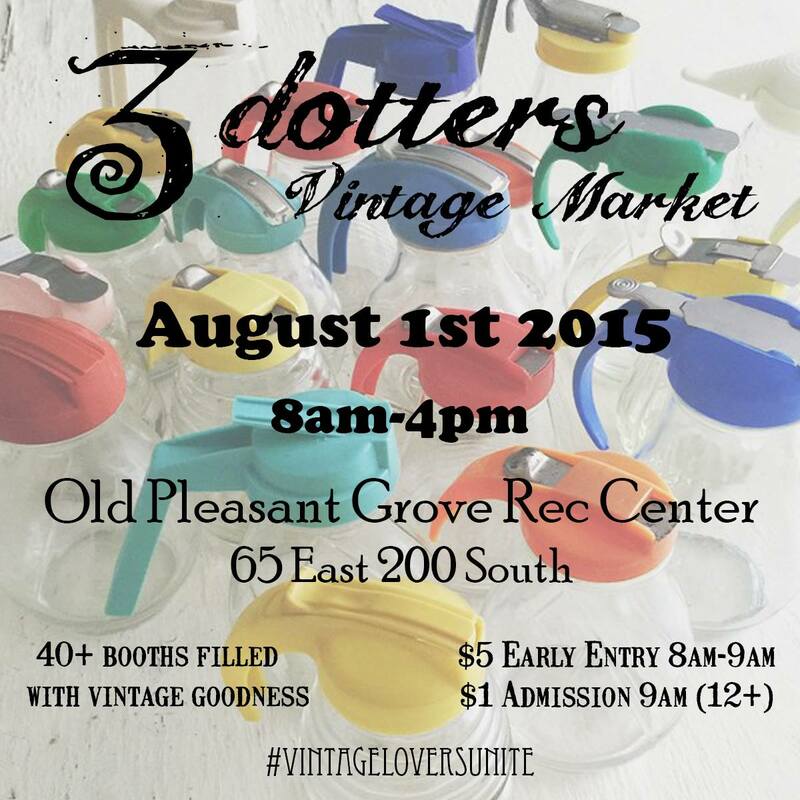 If you are in Utah I would love to see you at the Vintage Market! Please stop by and say hello! 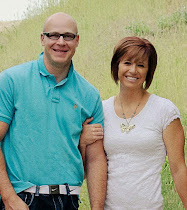 I have the opportunity to be a contributor on Lou Lou Girls blog today! 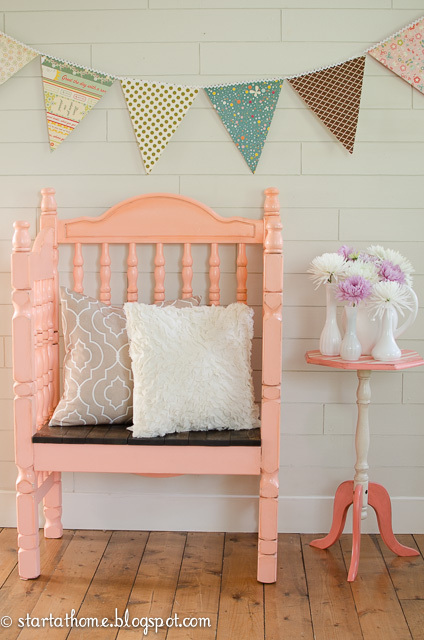 Head over to Lou Lou Girls for step by step instructions to build your own bench! 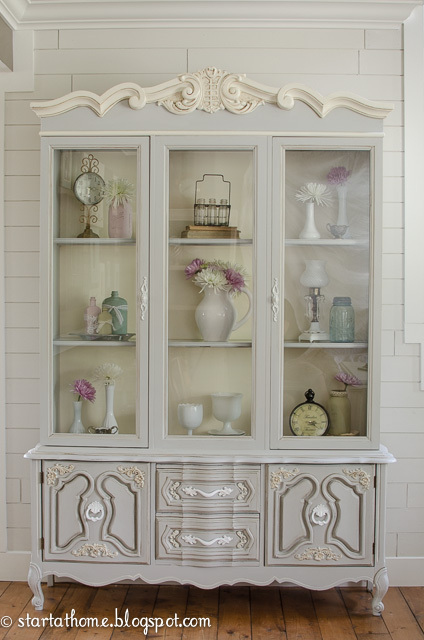 When I picked this hutch up from a garage sale I was a little worried about what was living in it. 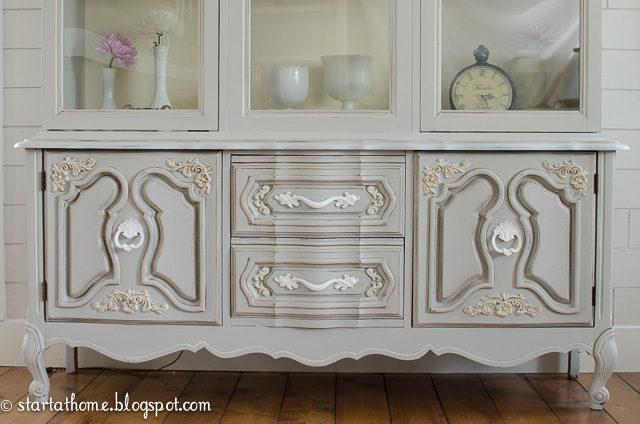 It was caked with spider webs and years of dust, but details like that just can't be passed up! And I am so glad I brought this beauty home. Look how nice she cleaned up. I spray most of my furniture with a professional paint sprayer, but my spray booth only has 6 foot ceiling, so this monster of a piece wouldn't fit. 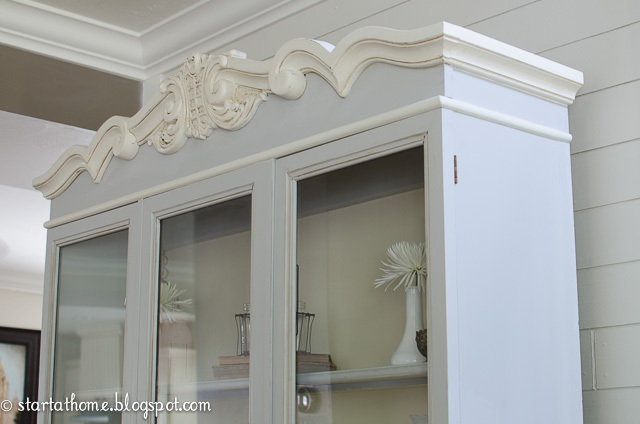 I used General Finishes Seagull Grey Milk Paint. 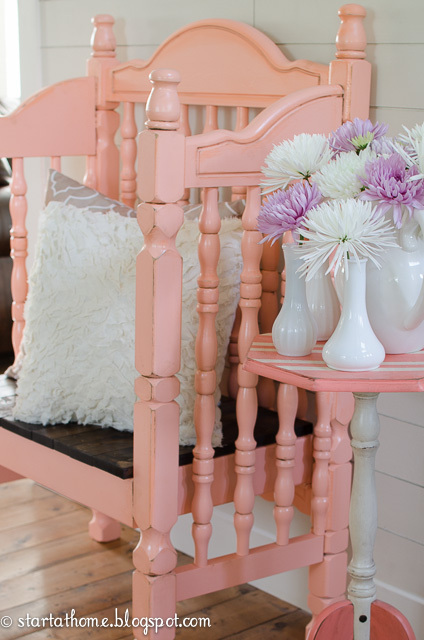 I like to hand paint with milk paint, the brush stokes are minimal and it sands to a smooth easier than latex. 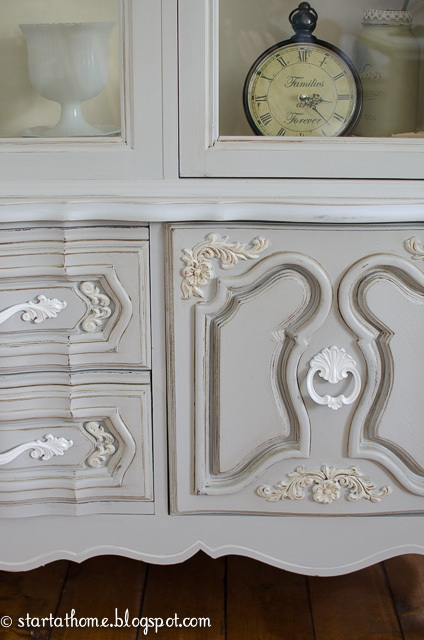 I used General Finishes Antique While on the details to really make them pop. I don't usually love water based top coats, as I don't think they are as durable. However, the lady at the store talked me into General Finishes Polyurethane Water Based Top Coat......and I am converted! It paints on so nicely leaving minimal brush marks and my children even put it to test by rubbing their sticky popsicle covered hands all over it, and to my surprise it wiped up so nicely! The popsicle juice bubbled up nicely on the top and didn't sink into the paint at all. Leave it to my children to test something out for us! This beautiful piece is FOR SALE! Please email me at brooke.n.larsen@gmail.com with any questions! 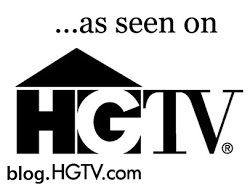 You may have heard me say it again...but I look forward to Saturday mornings so I can go hunting for treasures at garage sales. Some weeks I get lucky and other weeks...no such luck. Well I am happy to say at the first garage sale we went to...my girls always have to come and spend their quarters they earned the week. I hit the JACKPOT! 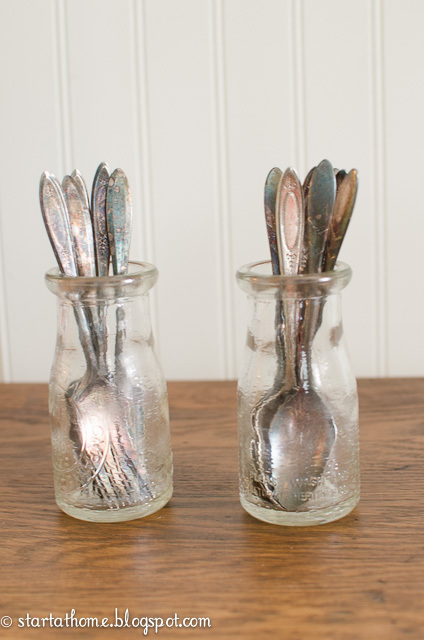 My first treasure is this silverware...yes, real silverware. Look at the beautiful patina on them! I got an entire box too and I am just so excited I don't even know what to do with them! Yes, I know this lamp shade is broken, but it isn't something I can't fix. 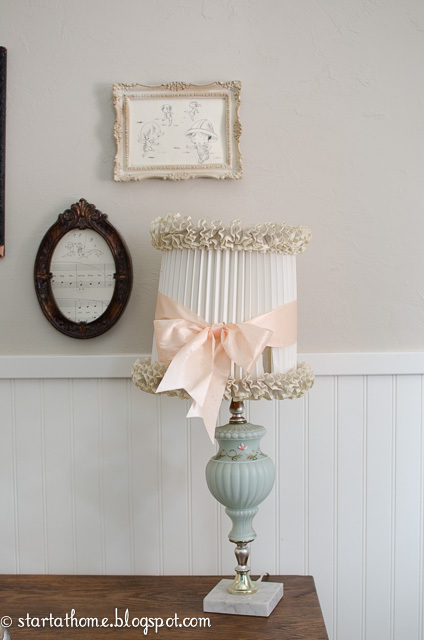 I loved all the personality of the shade and the lamp.....and don't worry the bow has to go. And last but not least, I found the Pepsi Cola bottle in the middle. 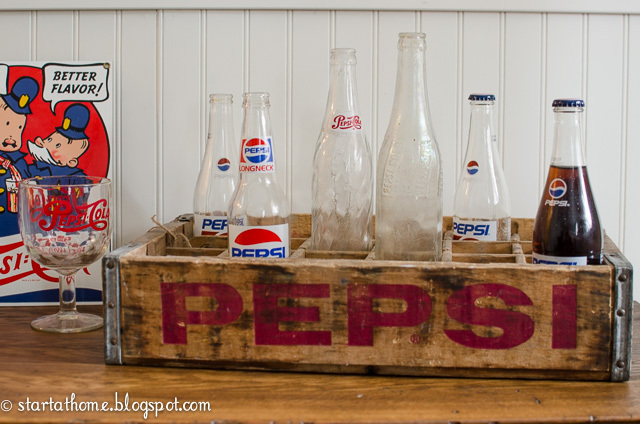 My husband loves anything Pepsi, and surprisingly it is hard to find. His collection is growing ever so slowly! I did find several milk glass vases. 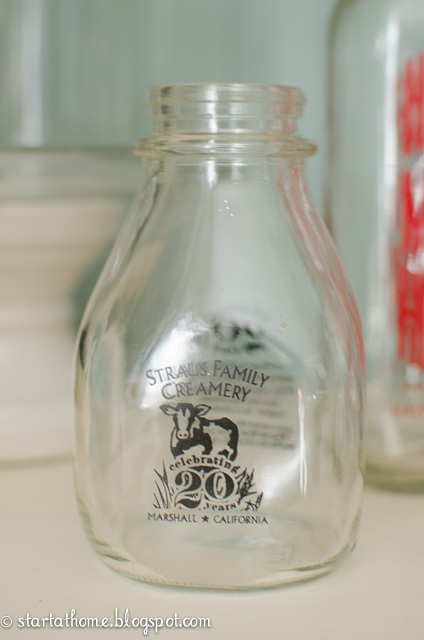 I don't know what it is about me and milk glass, but if I see milk glass I have to have it. I also brought home a hutch type thing, I am not sure what it is exactly, but I do know what I am going to turn it into. I am excited to get started on it...... I just need to finish my other half way done projects!! I have been wanting to be part of a Vintage Market for quite sometime. It seems to be one of those things that has been on my bucket list, but the time has just never seemed to be right....until NOW! 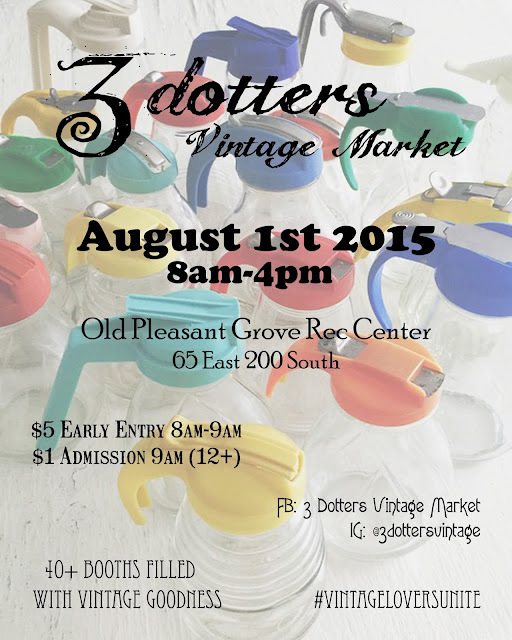 I am going to be part of the 3 Dotters Vintage Market on August 1st, and so the preparation begins. I have done my own in home boutique before but nothing at this level. I am a little nervous and anxious.....Will I plan for everything? What will I forget? 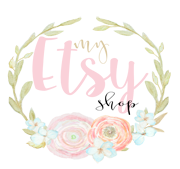 Will I price my items right? Will I have enough items or will I have too many? The questions are swirling around in my head at 100 mph. I suppose it is a good thing I am asking these questions in hopes to be as prepared as I can be. I have been a customer at many markets, it will be a change to be on the other side of things! 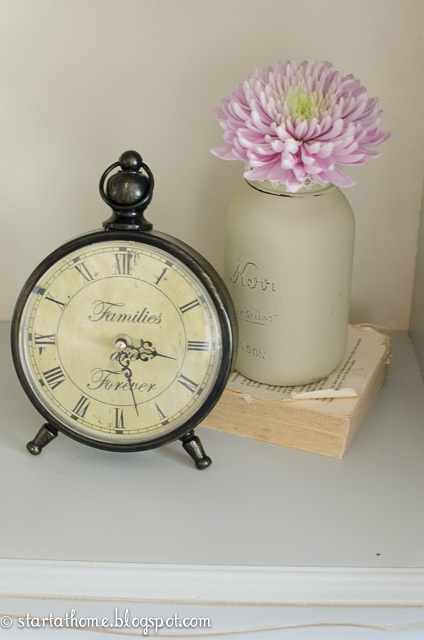 I have so many odds and ends I have collected over the years it will be good to go through things and get them all ready for the market and it gives me an excuse to shop....right??!! 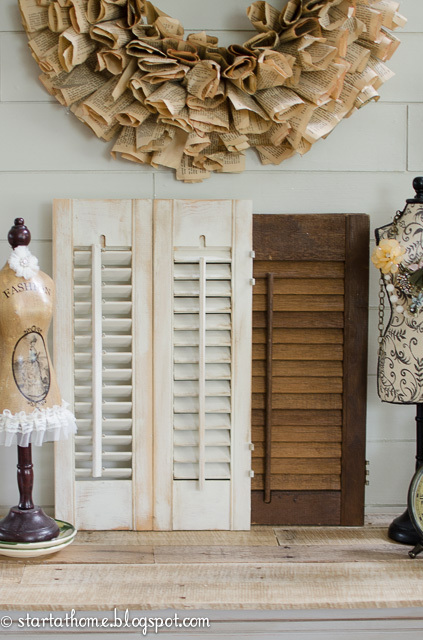 I have had these shutters stashed in my garage for way to long, they will be making their way to the market with me! If you can come to the Market I would love to see you, please stop by and introduce yourself, I would love to meet you!! 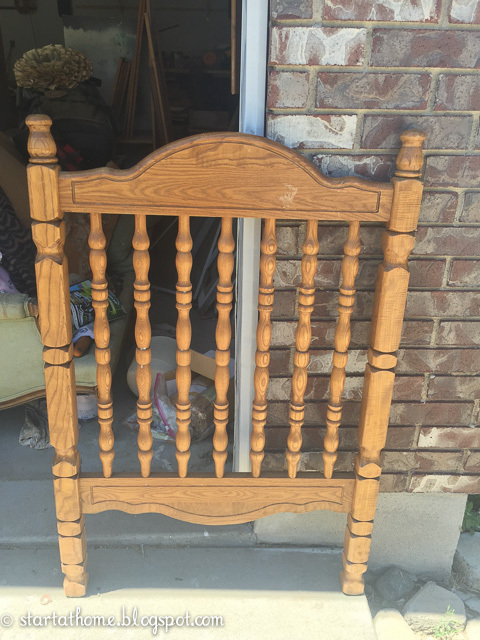 This cute wood high chair is my mom's. She had tried to paint it a few too many times, 4 to be exact. You can see it was blue, green, white and cream. 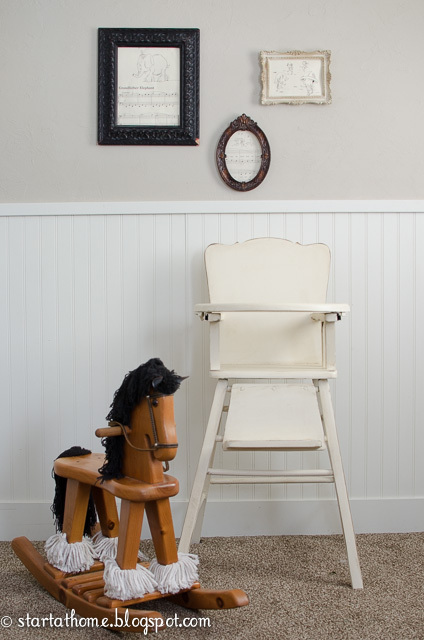 I supposed that is one of the great things about a wood high chair, if you get sick of it just paint it again. I wanted to use it for my little boy's first birthday, but it wasn't looking so great. I was hoping to take it home sand it up and give it a fresh new coat of paint. After about 10 minutes of sanding the paint was balling up and creating lumps....eeek....I hate it when that happens. I decided to pull out the stripper and start all over. I used my paint sprayer to paint it cream, I like to use Valspars Optimus. You can buy this type of Valspar at Ace Hardware. I was a little skeptical to use Valspar but I love the coverage and how it sprays through my sprayer! It has also been a very durable latex paint. With every event in your life comes a learning opportunity. 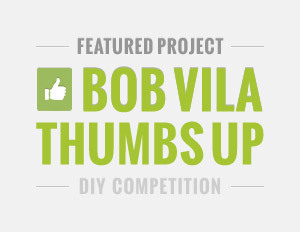 I was so excited when I got the email from Bob Vila that they had chosen my dresser turned bench to feature in their Thumbs Up Competition. These are the things I dream of. 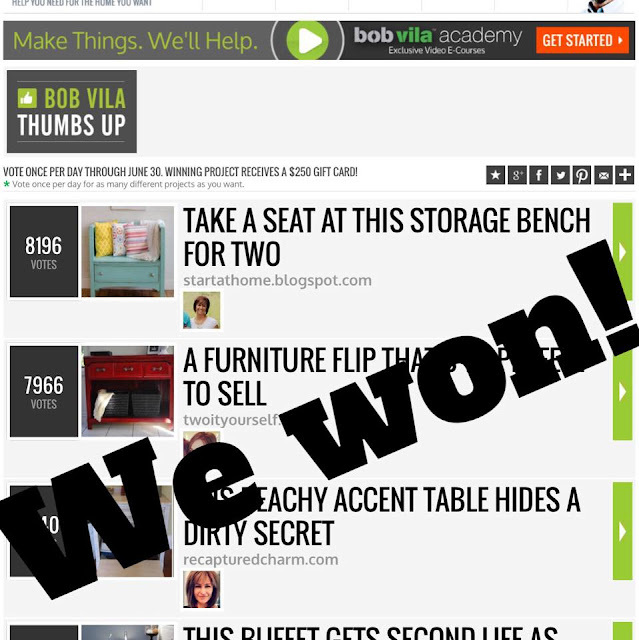 I am slightly competitive so I scoped out my competition and realized quickly I had some tough competition and it would be a stretch for little ol' me to win this. The first day out the gate was my daughters birthday, when I pulled up the stats that night I was already down 400 votes. WOW, right how do you come back from that? I knew I had to start right away marketing it and getting my project out there so people would see it and vote. I was getting a little desperate and had to start thinking out of the box...how was I going to get votes? I started sending out texts and messages to my friends and family asking them to vote. Followers started sharing it on their pages and voting. By about mid month I was amazed at the support I was receiving. As I would send out reminder texts I would often get texts back with things like "I have been voting on 5 devices every day and I have some of my friends doing the same thing." or I would just text random texts and messages from people to tell me I was up that day. I even got a text from my Grammy the day my Papa got out of a major surgery that I was up and they were both voting for me. At church on Sundays people would stop me to ask me how it was going and let me know they were voting and recruiting people too! Never in a million years would I have imagined this kind of support, and a lot of it was from people I didn't ask or even know. I know I too often get caught up in my own little world and forget to look outside the box, but today my heart is full of gratitude, not for winning this competition but for so much more than that. This month I realized how important it is to support one another, I learned that we all need each other for love, for support, for friendship it is the little things that make the difference! So Thank you so much to EVERYONE it is truly appreciated. I didn't win this...WE WON THIS!! !